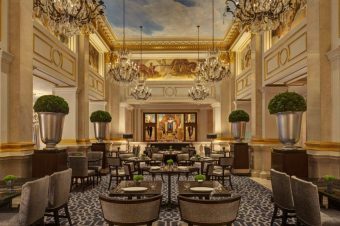 With a strong Parisian influence, The Mark is a hamlet for the Upper East Side’s most elegant residents and visitors who enjoy being seen. The concierge is infrequently asked to procure tickets to the Lion King. The lounge area of The Mark’s lobby. The Mark is not for the New York bound family excited about seeing the lights of Times Square, double decker bus tours, or the Statue of Liberty. In fact, The Mark isn’t really for those visiting Manhattan as tourists at all. 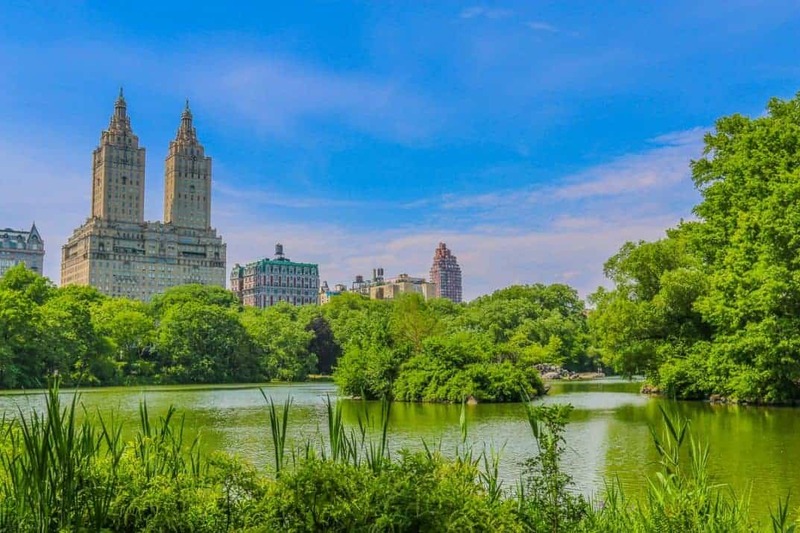 Stays at The Mark celebrate the leisurely pursuits New Yorkers themselves enjoy: shopping, eating, museums, and Central Park. The Mark is a Legend hotel with Preferred Hotels, the most exclusive in their hotel portfolio, and is entirely worthy of this distinction. 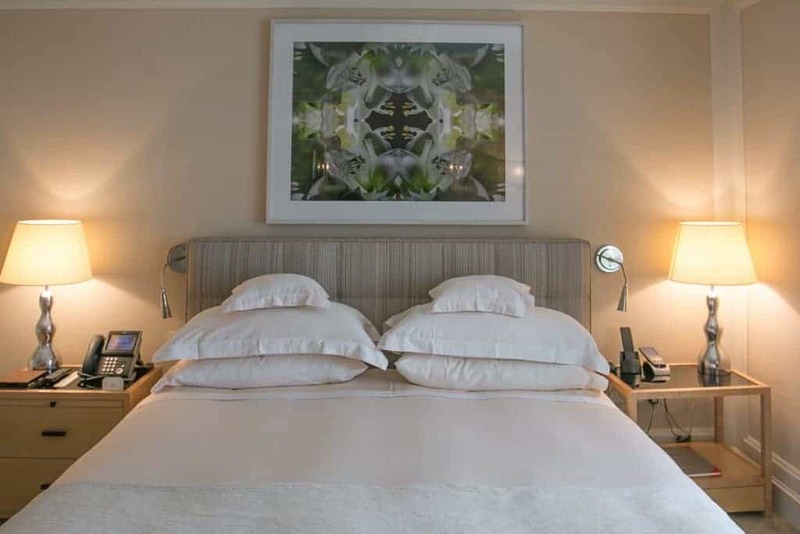 With an international staff providing formal, five-star service, a tad of condescension, and design by Parisian designer Patrick Grange whose most significant client was Yves Saint Laurent, The Mark is si français. We checked into The Mark during a summer downpour and took refuge after paying Uber’s highest surge pricing. The black and white lobby is subtle, but striking. 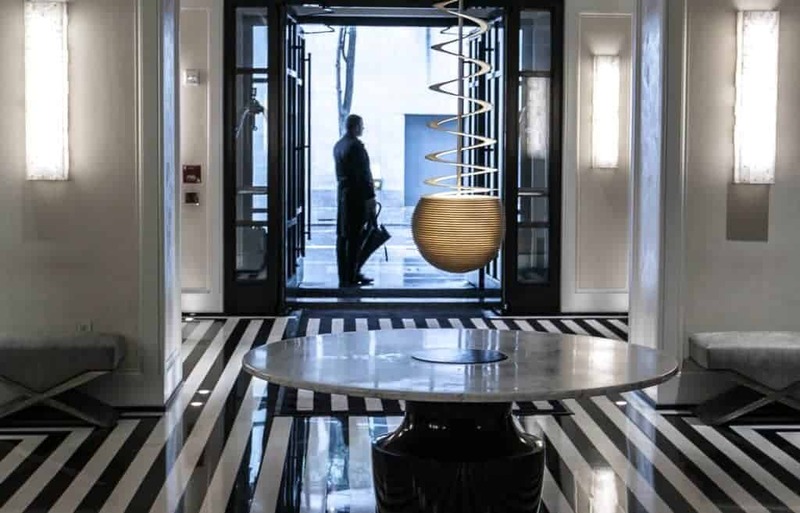 Grange commissioned unique sculptures, furniture, and light fixtures to create a custom space with a Ron Arad lamp as the focal point hovering above the foyer table like Foucault’s Pendulum. 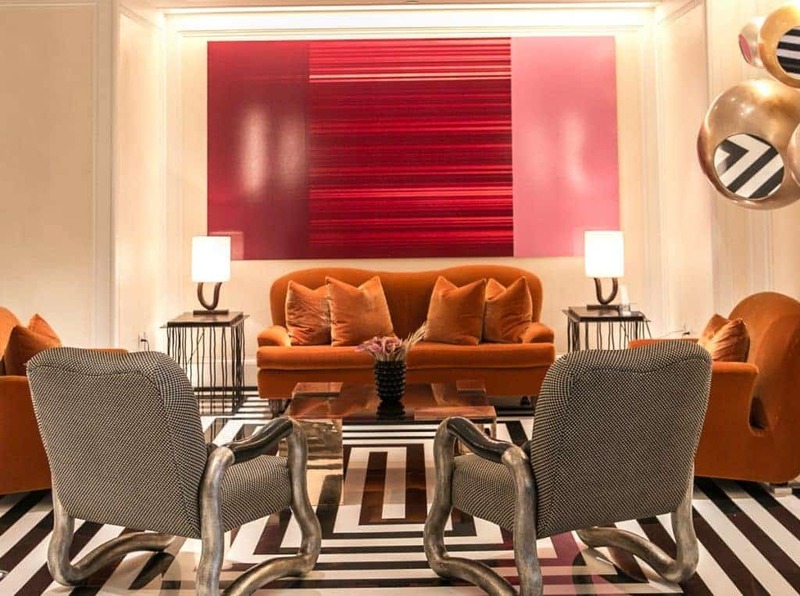 You enter a world of high design once you step into the Mark’s lobby. Even though The Mark has spectacular family amenities, parents in the know choose the Mark to escape the messiness of parenting. It’s a parent’s true vacation to enter the world of the effortlessly chic. 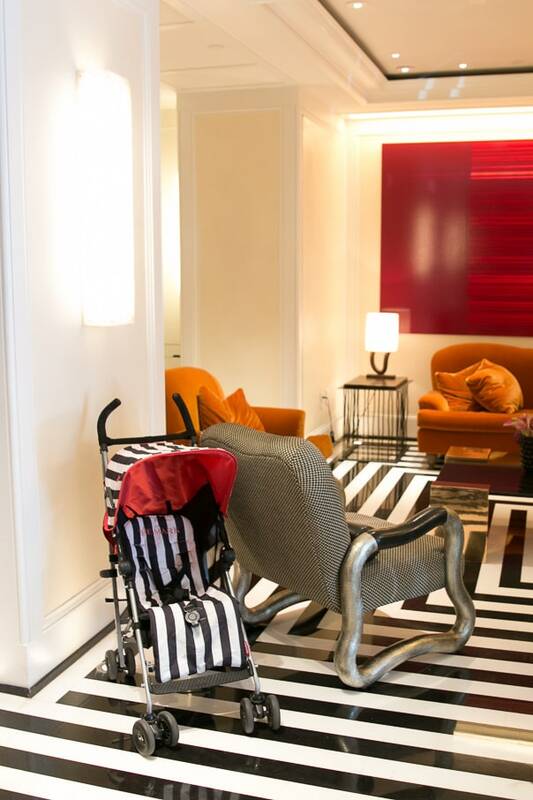 The custom Maclaren strollers made for Mark guests. Be forewarned if you do bring your children. The ideal age would be after they stop crying for no reason and when you can still both style their hair and dress them without a fight. Leave the Gap and Crewcuts play clothes at home. Fill the suitcase with those amazing Bon Point outfits you keep saving for a special occasion. This is what you have been saving them for. Just pretend they always dress this way and look this good. 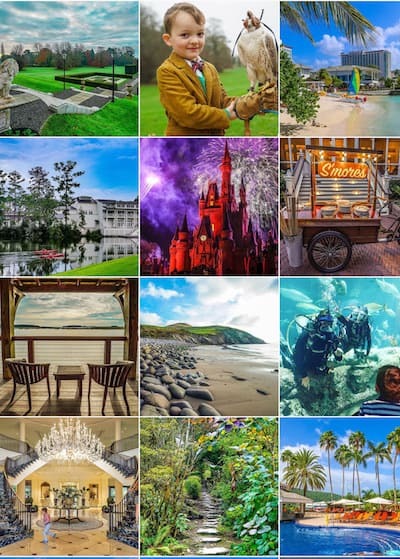 Every luxury brand in hospitality consciously creates their guest experience, but the Mark hotel decided to run wild with their brand for the amusement of their guests. 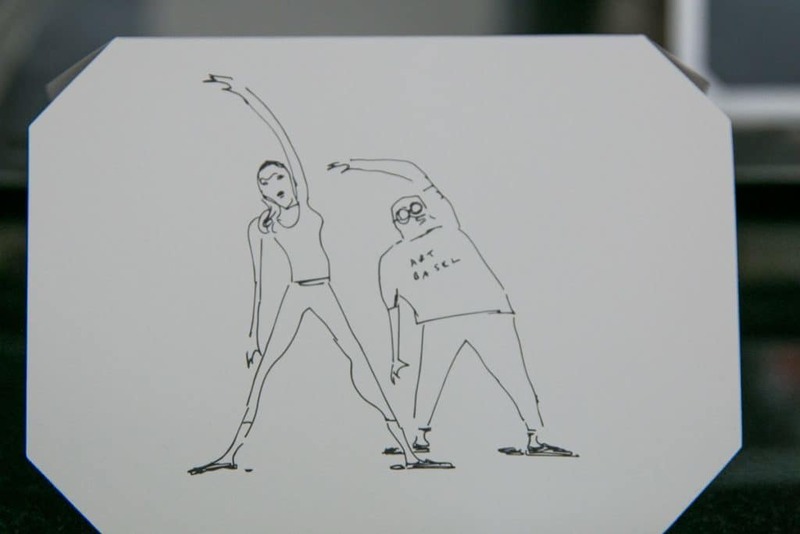 In fact I would say that the Marc Hotel doesn’t really have a brand identity but an ego. You’ll see the hotel’s playful side even before you enter. Striking black, white, and orange Mark bicycles, a Mark hotdog cart, and a Mark Pedi cab touted as the Bergdorf Goodman express surround the front entrance. My kids accepted a lift down the block in the Pedi cab, but I refused to give them my Bergdorf charge card, so they decided to turn around. 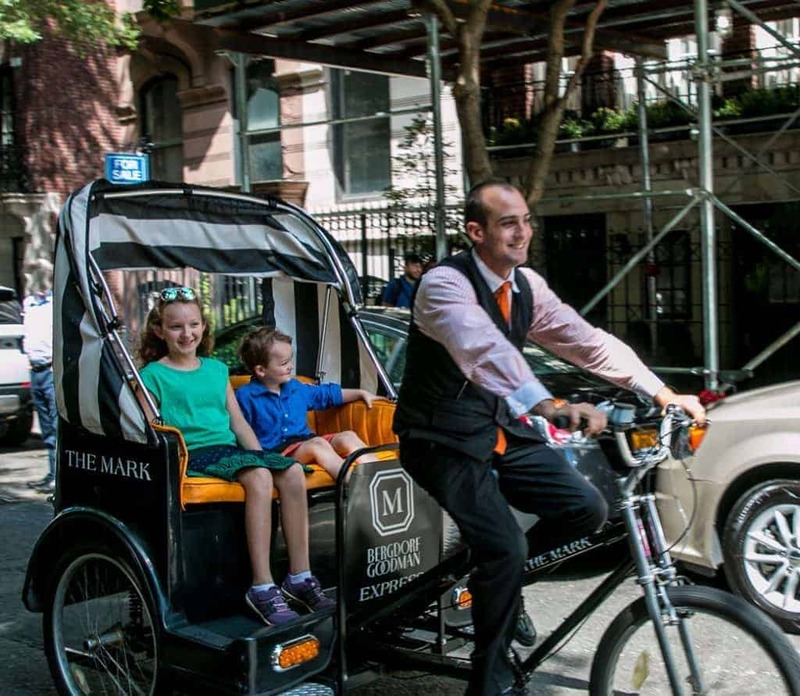 Taking the Bergdorf Express Pedi Cab from The Mark is an easy jaunt down Fifth Avenue. Bergdorf’s is a wonderful destination to visit. Well behaved children will do fine at the café off the cosmetics department in the basement, and the children’s small but beautiful selection on the 7th floor is wonderful browsing. At the holidays, nothing is prettier than enjoying their tree displays and decorations. Families can choose between fabulous suites or adjoining rooms that share a common entry so that both doors can be locked off to one key. Some luxury hotels indulge children; some indulge pets. The Mark pampers both. 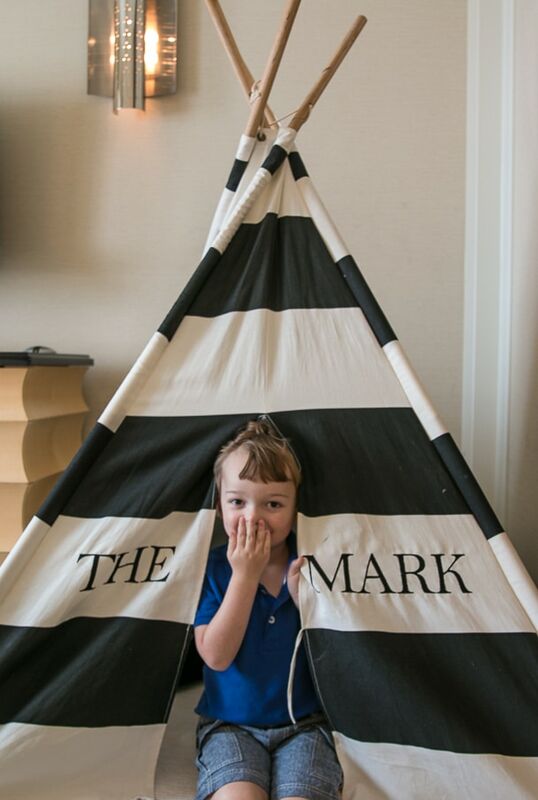 Our children received an in-room tent for play, adorned in the Mark’s signature black and white stripes, and a tray of decorate your own mini red velvet cakes. This stay was off to a fabulous start. Families can request in room teepees for a check-in surprise. When my four year old son curiously my took the New York Times Book Review into the teepee the following morning, it felt like a jab—taunting me of my pre-motherhood days reading the Sunday Times. The Mark’s rooms are better stocked than most five-star hotels. Way beyond cans of Pringles and packages of M&M’s (though they are there next the Swedish Fish), the Mark has you covered if you forgot your underwear. Agent Provocateur thongs await alongside mini magnolia scented travel candles by exclusive fragrance line Frederic Malle. There’s a serious amount of candy hidden in their very custom mini bar cabinetry, making any binge experience feel less shameful and more of a home design experience. All of the amenities of the Mark feature the same cartoonist. 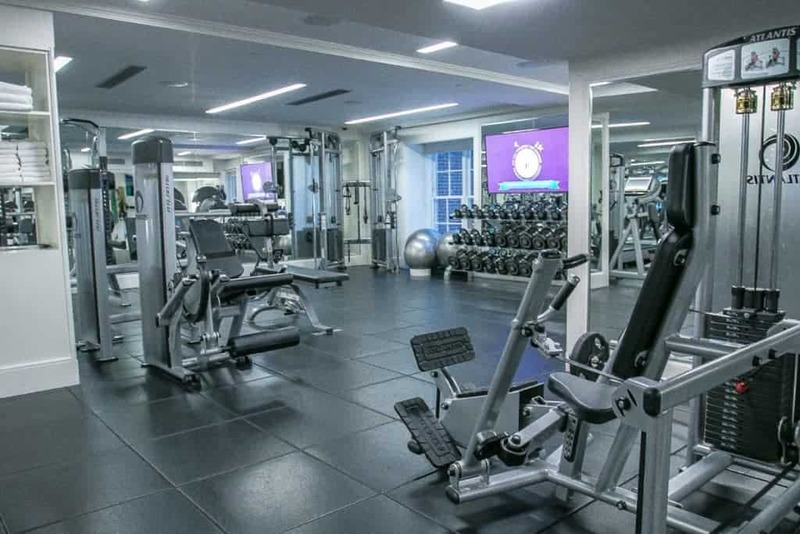 This card invites guests to book personal training in the fitness center. The bathrooms at The Mark are stunning, and they were my favorite feature of the hotel rooms. 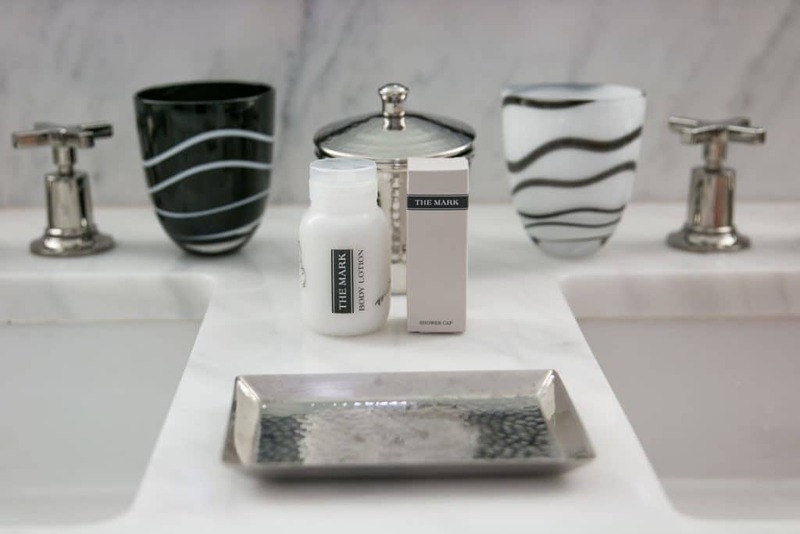 Ample Carrera marble, towel warming bars, and their adorable signature sketched amenities by the Mark’s signature cartoonist. I think all four of us squeezed in a record number of bubble baths during our brief stay. 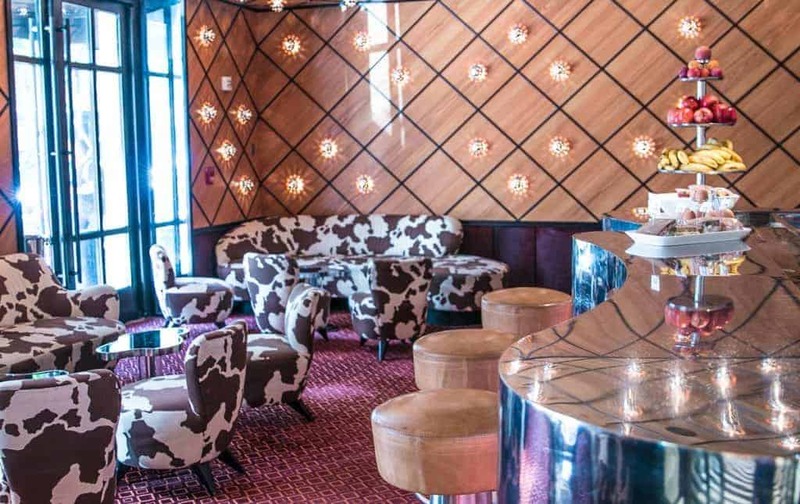 Nowhere in the hotel does the design of the Mark hotel dazzle more than the restaurant. 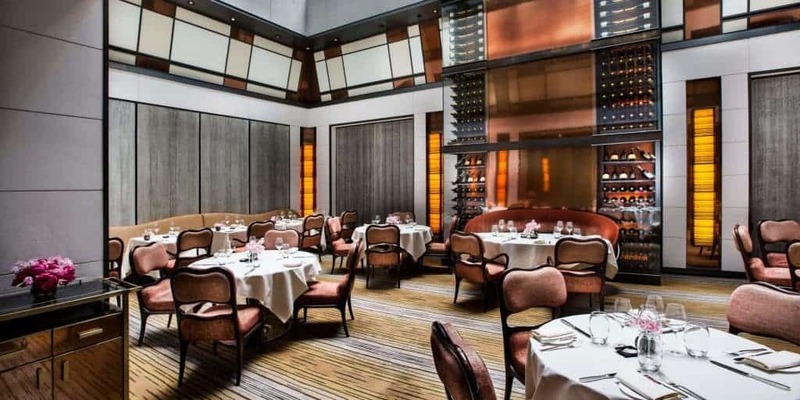 Despite the impressive space that ranks, in my opinion, with Philip Johnson’s beloved but closed Four Seasons restaurant, the all day menus offer neighborhood casual fare in the farm-to-table style Jean-George is known for serving. 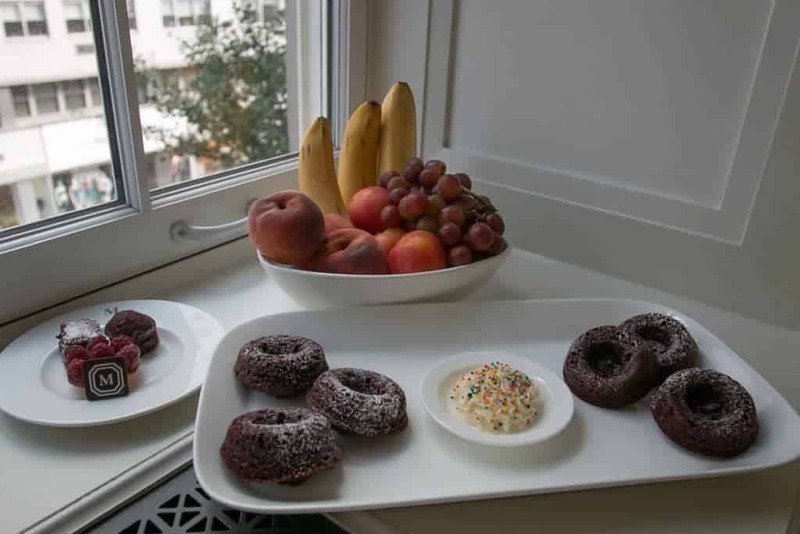 The dining room offers children’s favorites, and we enjoyed breakfast and lunch, though we would not take our children for dinner there, when I think in-room dining is more appropriate. Even though the menu caters well to the beautiful people around with juices, smoothies, and other spa menu items, they make a great French fry, and my husband helped himself to a second order. The Bar at the Mark is a hot ticket for cocktails later in the day, but it starts out as a lounge offering coffees and continental breakfast items. Before the bar becomes a place to be seen for cocktails, it is a great place for a cup of coffee. 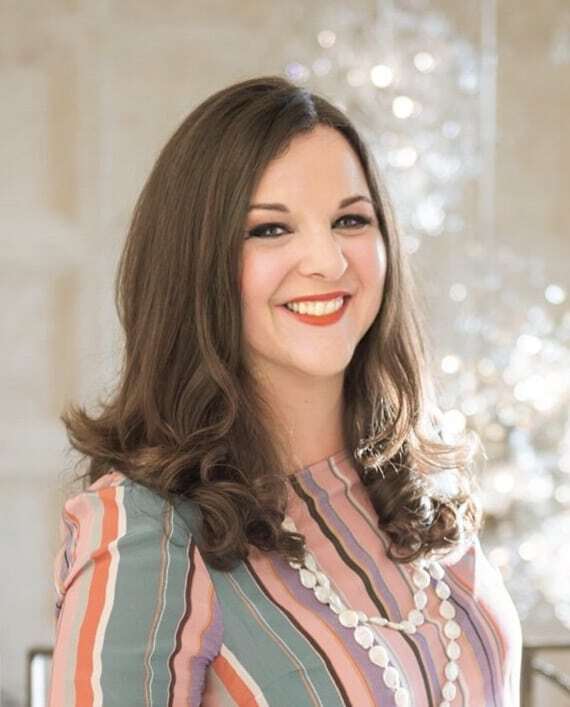 There is not a complete spa on site, though there is a Frederic Fekkai salon that offers a targeted spa menu in addition to its hair services. I ran down and got a cut since I had been traveling several weeks prior. There are few salons I would let a brand new stylist go after my hair with a pair of scissors and cut new layers, but I was in excellent hands. 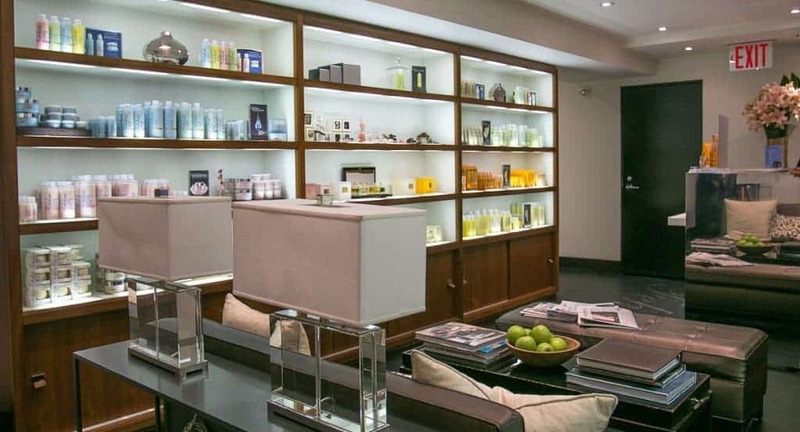 The Frederic Fekkai Salon at The Mark New York. There’s an extensive fitness center with many specialized personal training services available, too. I called New York home for eight incredible years. When I hear about people wanting to see the sites of New York, I confess I cringe at their itineraries. The greatest part of New York, to me, is its population. 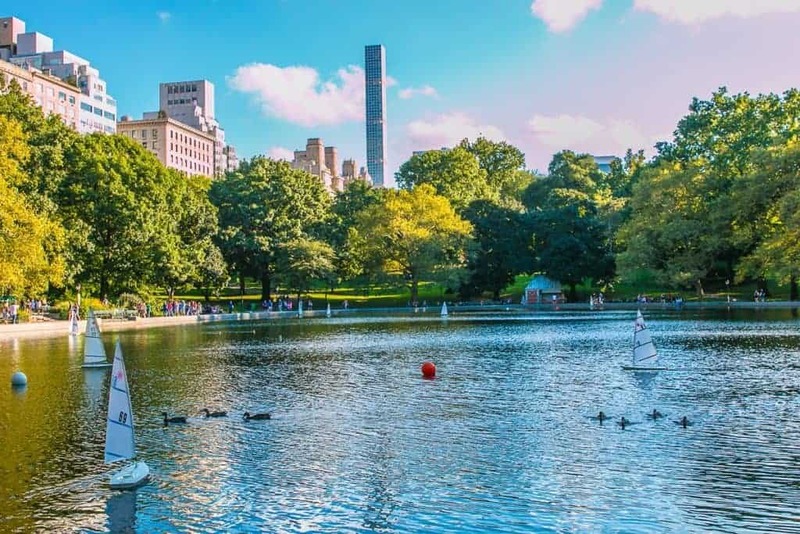 TIP: We love visiting New York during summer holiday weekends when locals flee to the country or beaches. Memorial Day and Labor Day are our favorite trip dates. On a summer day in Central Park, you’ll see, among several tourists, wedding parties, families, couples on dates, young professionals exercising, seniors getting some daily steps in fresh air, musicians and dancers performing showcasing the global population that is what New York is all about as one of the greatest cities in the world. Victoria Gardens replaces the Wollman Rink in the summer months. Our favorite part of the stay, besides those bubble baths, was taking The Mark’s beautiful black and white striped Maclaren stroller for a day in Central Park. 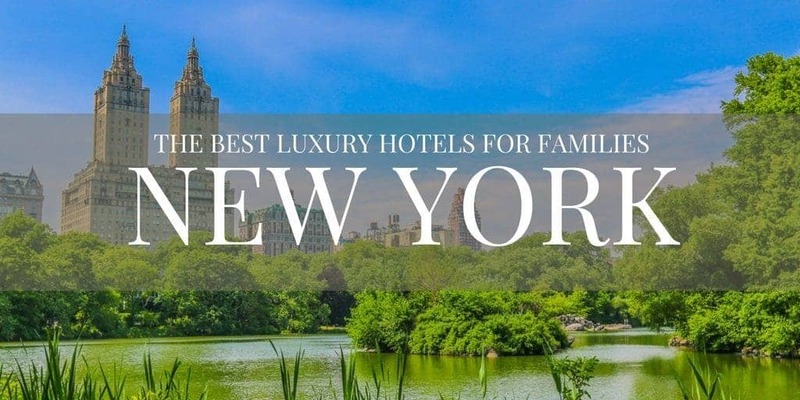 This is our easily now one of our favorite hotels near Central Park. Many hotels near Central Park are across the street from its Southern, Eastern, and Western borders, but the park is big. 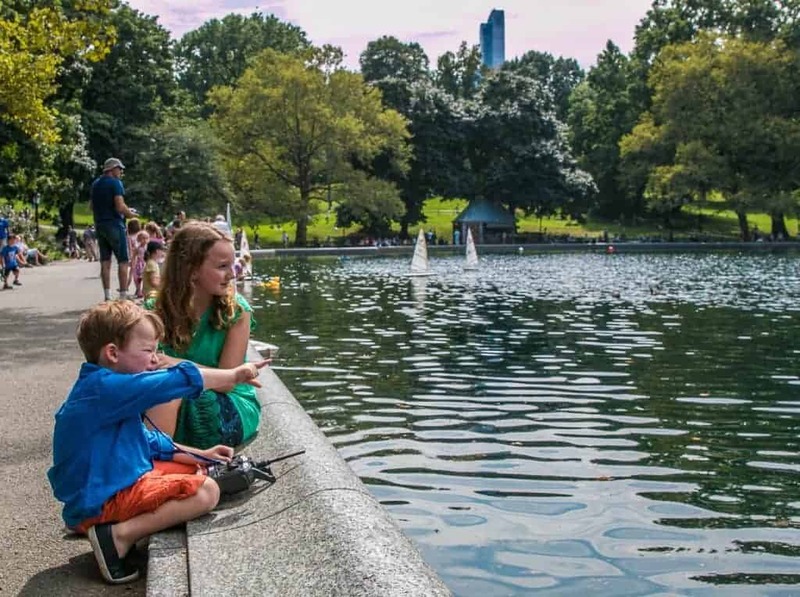 The Mark is a step from some of the best things to do in Central Park with kids. The hotel packed a beautiful picnic and gave us a Mark picnic blanket, and we were off to enjoy a summer day. 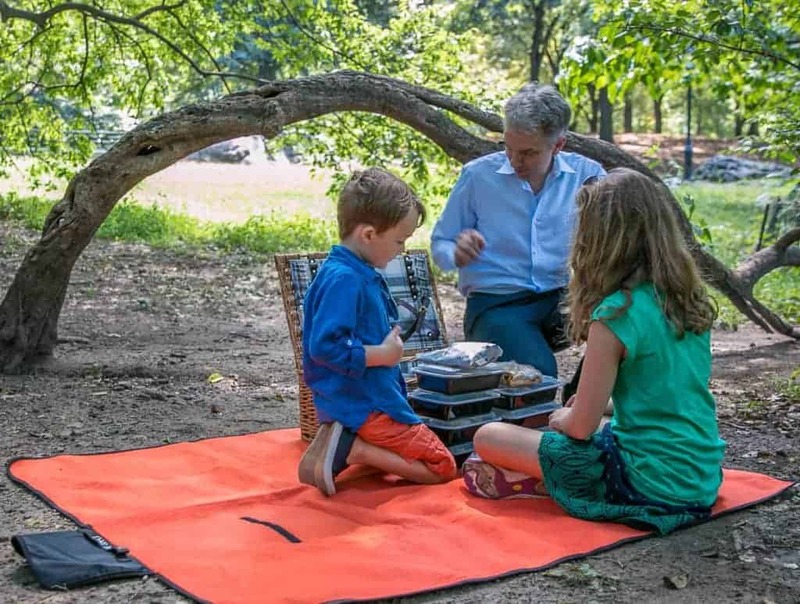 The Mark Hotel prepared an incredible picnic lunch to take to the park. The first places families will see are playgrounds near the 77th street entrance. 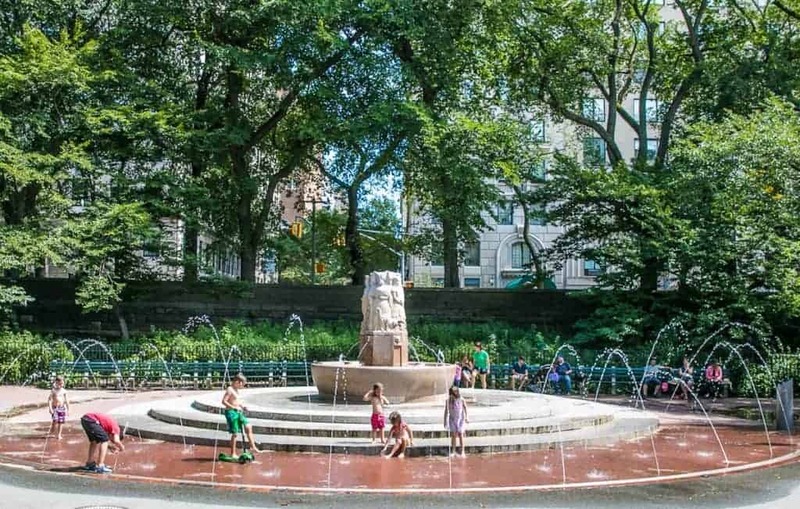 Families with toddlers and preschoolers may choose to walk to the right on Fifth Avenue towards the Met to the Ruth and Arthur Smadbeck-Heckscher East Playground that is geared for younger children. We chose the James Michael Levin Playground off 76th Street for our older children. There are water spray features on really hot days, but I confess I wouldn’t let my kids return to The Mark dripping in that stunning lobby. 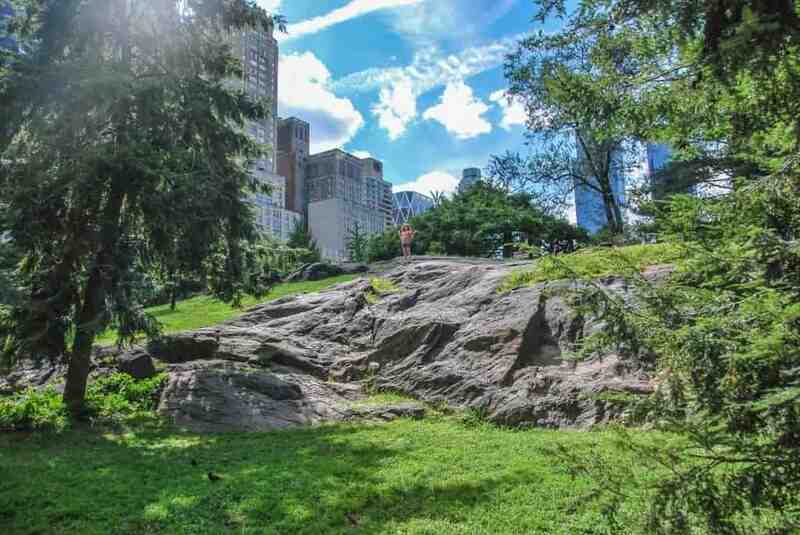 As popular as the playgrounds are, the sloped rocks that are perfect for climbing will always entice kids more. Just south lies the large Alice and Wonderland sculptor that children climb, the Hans Christen Anderson sculpture and the Conservatory Waters where children (and plenty of grown ups) rent sail boats to navigate. 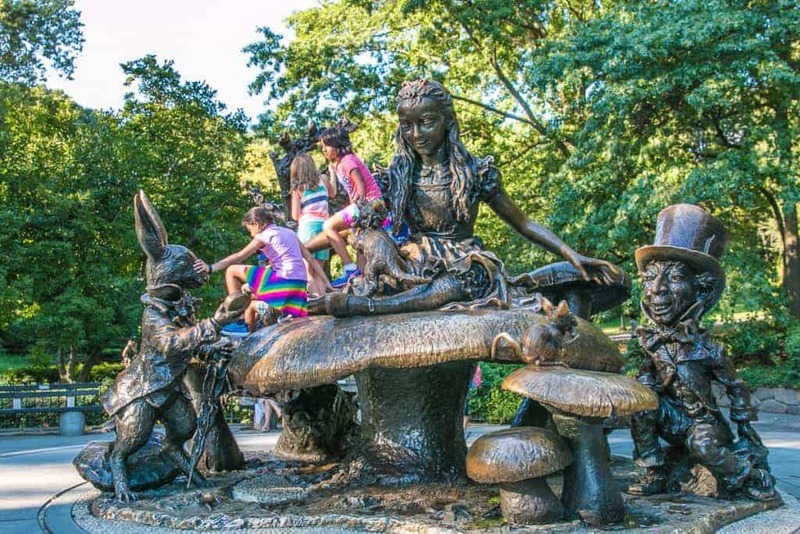 The Alice in Wonderland structure in Central Park. 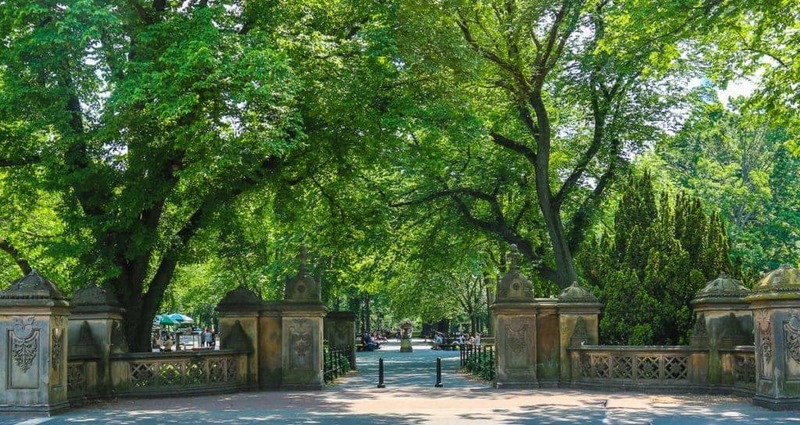 From there, families can either head south and bump into more playgrounds, including the Balto playground uniquely designed to showcase the terrain of Central Park. The zoo is the final stop along Fifth Avenue. Here is a great interactive map to refer to before or during your outing. Younger children will love the smaller zoo just north of the main zoo. 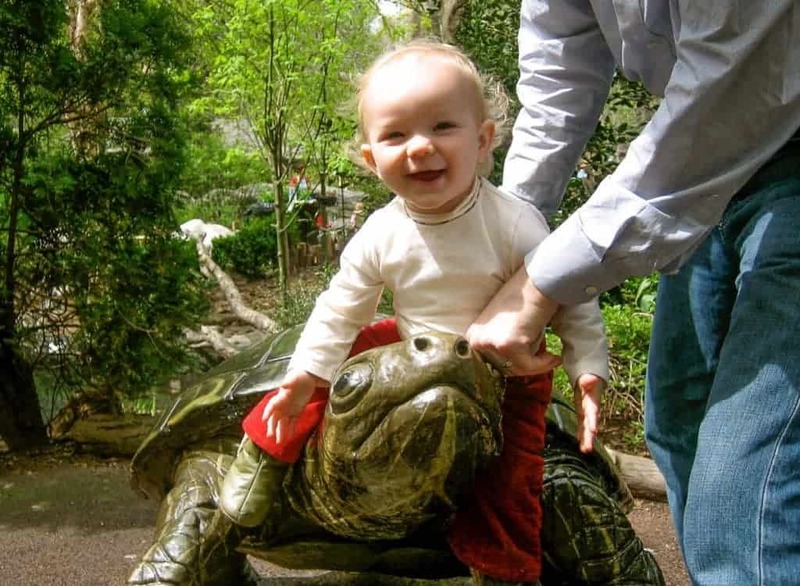 There is a special Tisch zoo exhibit for younger children in Central Park. 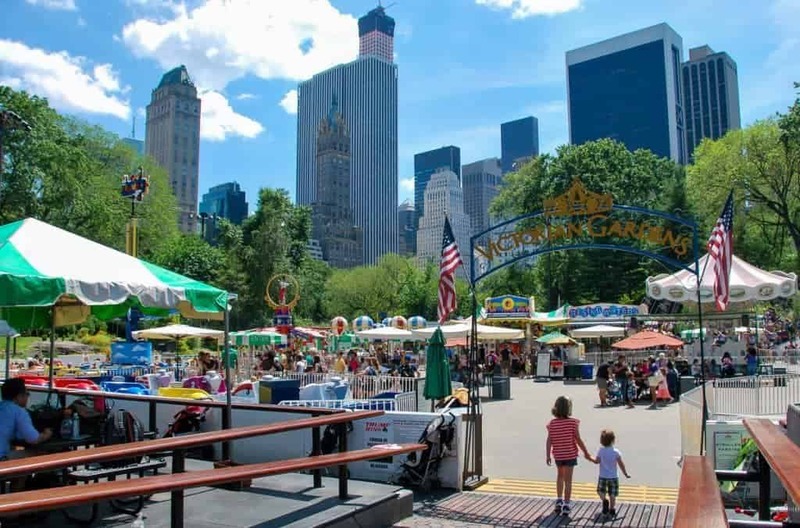 We prefer to head west to Bethesda Fountain and make our way down the Mall where various vendors selling giant bubble makers, musicians, or dance groups practicing tango entertain the families strolling by. 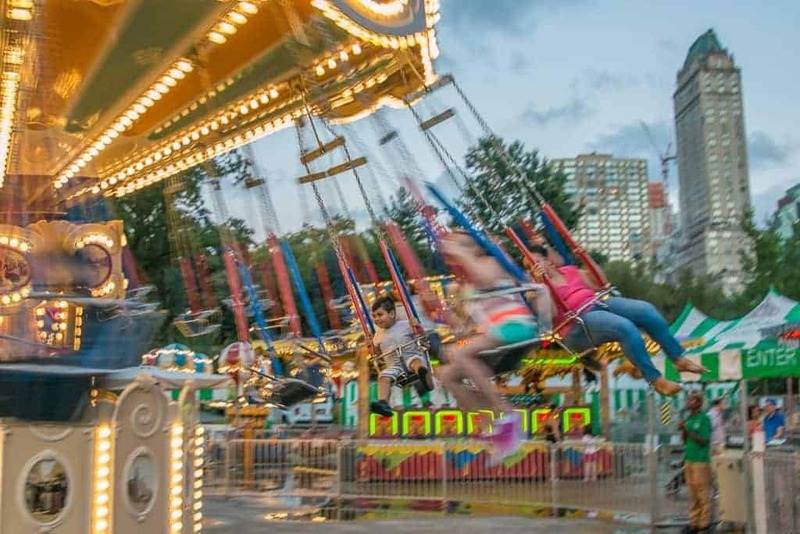 In the summer months when the Wollman Skating Rink is closed, we enjoy its summertime identity as Victoria Gardens, a mini amusement park for children under the age of 10. Most rides at Victoria Gardens are for those well under 10 except a few. It’s most enjoyable at the end of the day when the summer heat breaks. It also works well as a reward for children who are patient while exploring the Met earlier in the trip. Guests of The Mark receive VIP passes to the Met, so ask the concierge on your way out the door for them. If you do not request a basket from the Mark, there are two wonderful options at the Southwestern entrance at Columbus Circle. Bouchon Bakery inside the Time Warner Center offers heavenly viennoiserie options, a killer ham and cheese sandwich, as does the nearby Maison Kayser at 58th and Broadway. In a pinch, there’s a full Whole Foods in the basement level of the Time Warner Center. 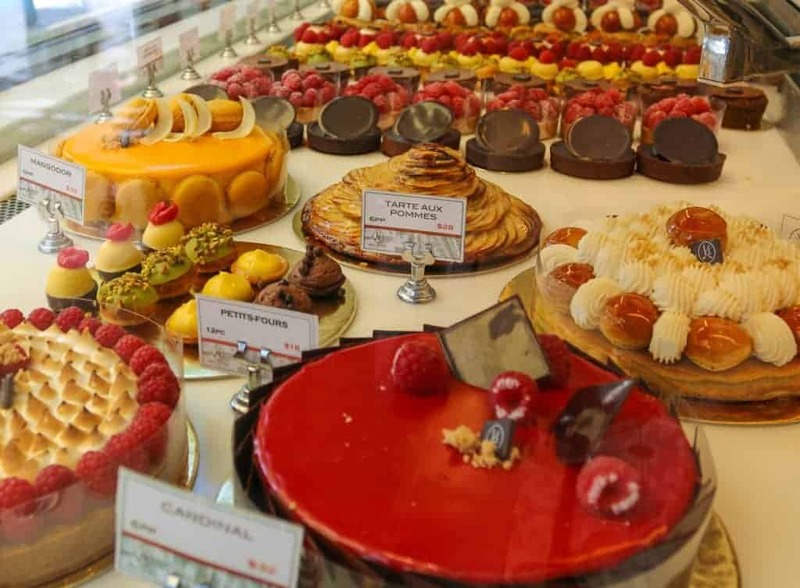 Maison Kayser offers incredible French pastries and breads. And the Plaza Food Hall is a must to enjoy below the hotel. One can purchase either picnic food at the various food purveyors or dine after playing in the park at the Todd English Food Hall. It was delightful to return to such an indulgent oasis after a day of city family adventures. 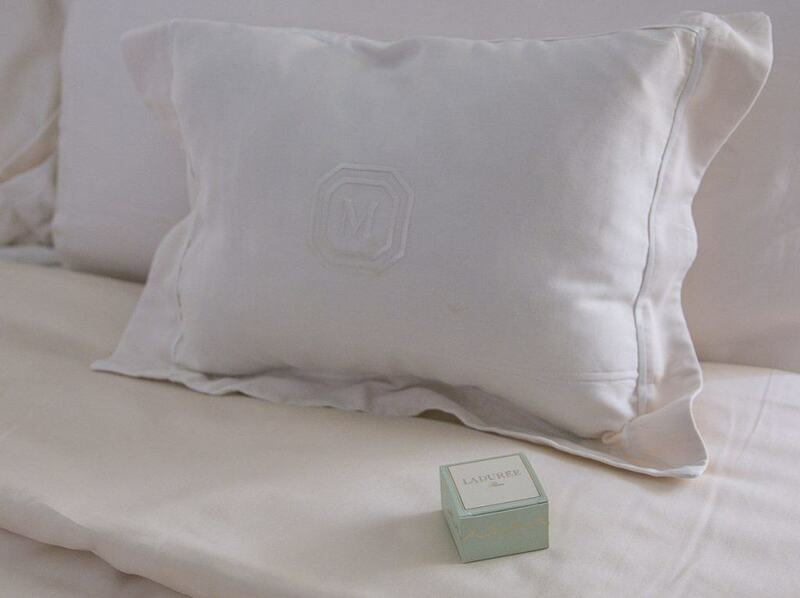 The Ladurée macarons on our pillows were a lovely touch to our Paris infused break in New York. The Mark Hotel New York offers Ladurée macarons at turndown. Although we were guest of The Mark Hotel, these opinions are entirely my own. Check your dates for rates at The Mark. Delightful story. I long for my New Jersey life when Manhattan visits were more frequent.